This post was originally published in the August issue of Trenchless Technology. It was written by Fracta's Chief Revenue Officer, Doug Hatler. A water loss control program helps to identify real or physical losses of water from the water system and apparent loses, the water that is consumed but not accounted for. Real losses represent costs to a water system through the additional energy and chemical usage required to treat the lost water. Apparent losses represent Non-Revenue Loss (NRW); water that has been produced and is “lost” before it reaches the customer. Losses can be real losses (through leaks, sometimes also referred to as physical losses) or apparent losses (for example through theft or metering inaccuracies). High levels of NRW are detrimental to the financial viability of water utilities, as well to the quality of water itself. One way to identify leaks is through a leak detection program. Water main leak detection can be used to determine if and where a leak has occurred in a water main system. A leak detection program establishes system integrity – one of the quickest ways to find out about the general condition of a distribution system is to do a leak detection project. In addition to locating non-revenue water, a leak survey can also be a way of finding out more about the overall integrity of your system. Leak detection used to be considered a luxury service. Just a short 20 years ago only water districts with large budgets could afford to hire an outside firm to survey their district and pinpoint the leak locations. These firms were called in when water surfaced or an emergency warranted the expense. Times have changed with numerous states now imposing water loss audit requirements and NRW limits on water utilities. There is a new emphasis on efficiently finding and fixing leaks in water mains. With limited budgets for leak detection services, where should a water utility send the crews? Many water district personnel know where their worst areas are because that is where they spend their time fixing leaks and continually maintaining the system. But sometimes their nonrevenue water issues are not where they are looking and can be in an area that does not garner their attention. Traditional approaches to leak detection typically start with services in areas with the oldest pipe and then work through the entire utility’s system as budget becomes available. For example, if a utility can afford to do leak detection services on 25 percent of its system annually, this approach means that the entire system would be covered over a four-year period, starting with the area of the system that is oldest. Artificial intelligence (AI), particularly the branch called machine learning (ML), is becoming more frequently used within the water industry. It is being applied in leak detection to aid in targeting the riskiest water pipes. Artificial intelligence is the science, technology and methodologies used to train computers to “think” more like humans by simply supplying the computer with data and allowing the computer to determine the rules that govern the data. Computers will use their own processes to deduce patterns within the data, and they typically uncover rules and patterns more optimized and discrete than what could be produced by humans alone. The more unbiased data a computer receives, the more it is able to course correct and further refine and improve its performance. In short, AI is simply a tool to easily model data, developed to help humans make decisions and find patterns within complex interactions of multiple variables. Machine learning – a term often used in conjunction with Artificial Intelligence – is this computer aided (i.e. “machine”) optimized pattern recognition process. 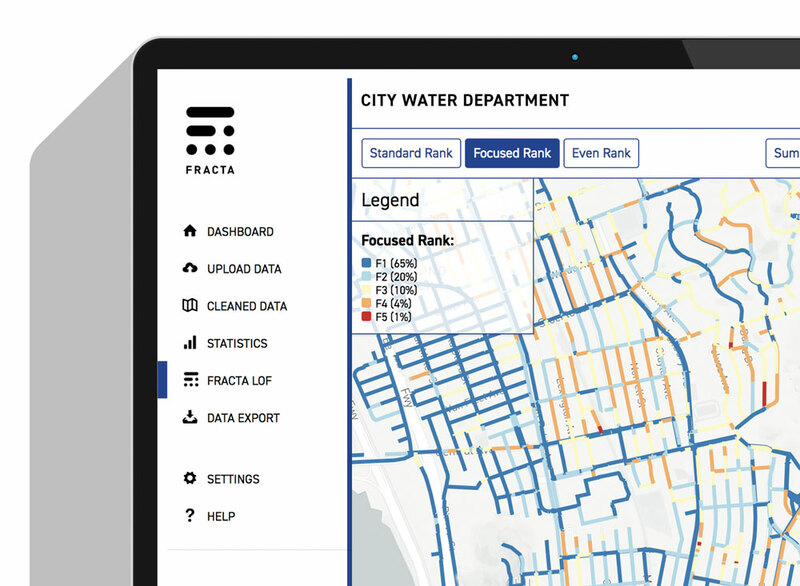 Fracta, of Redwood City, California, has created a solution that uses machine learning to generate discrete likelihood of failure (LOF) ratings for each water main pipe segment (the percentage likelihood that the pipe will break in the next five years). Fracta’s LOF ratings are generated using three sources of data: 1) the utility’s GIS/asset data (pipe location, installation year, size and material), 2) the utility’s data on main break history, and 3) location variables that Fracta has collected which characterize the environment that the pipe has been in since being put in the ground. By leveraging these data sources, a machine learning generated LOF rating can be generated in four to eight weeks for each pipe segment. The LOF output is used to prioritize water mains for replacement (by targeting capital replacement dollars at the pipes most likely to break) but can also be used for targeted leak detection. Machine learning generated LOF ratings demonstrate that it’s not always the oldest pipe which is most likely to break. Further, some pipes are more than five to 10 times likely to break than others. With this information in hand the water utility can annually target leak detection services at the pipes most likely to be leaking. While still in its early stages, this approach has the promise of enabling utilities to find a much larger percentage of their leaks per dollar spent on leak detection services. The cost of adding a machine learning LOF rating is perhaps 10 percent or less on the dollar/mile fee of leak detection services, with the potential for many multiples of that in leaks found per dollar. Utility Services Associates, a leak detection company that worked throughout the United States for 30 years, has seen this shift in the industry and has been looking for smarter ways to assist their clients and their budgeting requirements. “This is a game changer. Now, with AI and Machine Learning we can concentrate our leak detection efforts in areas where the LOF is high and, likewise, assist our clients toward a better ROI with their leak detection budgets,” says Jeff Benjamin with Utility Services Associates. In the future this type of targeted leak detection can lead to reduction in water loss from mains as less money is spent on finding leaks on mains, and more money is available for fixing leaks on mains. The key is to find small leaks before they become catastrophic and AI and machine learning can get us to the point of identifying those pipe segments which have never broken before but have a high LOF. Incorporating the Fracta AI digital condition assessment solution into a leak detection program can lower costs while helping reduce non-revenue water loss and more efficiently allocate pipe repair and replacement capital investment.